This weekend I’m up in Yorkshire for various family festivities, so I’m keeping this post pretty short. And sweet (of course), which most of my posts tend to be. With a sprinkle of toasted poppy seeds for texture, a scraping of lemon zest for zing and a swirl of smooth, sharp blueberry buttercream simply for the sake of it. I don’t often make cupcakes, but when I do, I like them to be light, moist and full of flavour. The sponge in these is as soft and fluffy as can be, and the buttercream not too thick, sharpened with cream cheese and an unsweetened fruit purée. The flowers are a little bit fancy – my very first attempt at working with sugar paste, which I want to work on improving over the next few months* – but without the flowers these little cakes are simplicity itself, topped with nothing more extravagant than a couple of beautiful ripe blueberries. 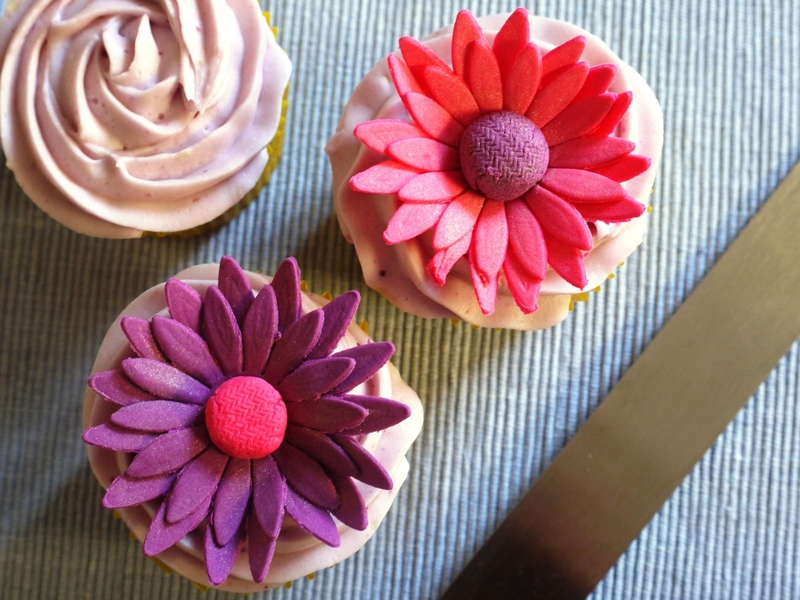 With their bright, fruity flavour and and pretty pastel colouring, these cupcakes are perfect to welcome in the Spring. If you’re reading this post before Easter, they’d make a great addition to an afternoon tea this weekend. And if you’re reading this after Easter, slowly crawling your way out of a chocolate-induced coma, they might be just the sort of sweet, light treat you’re looking for to remind you that there is a whole world of desserts out there beyond those of the Easter-egg shaped variety. *If you follow me on Twitter, you’ll know that Carnivorous Boyfriend’s Mum has asked me to make the decorations for her wedding cake in August this year. It’s a big task, and I’ve got a long way to go from this very first attempt, but I’ll be posting my learnings along the way over the next few months…wish me luck! Preheat the oven to 180 degrees C. Line two 6-hole muffin tins cupcake cases. Toast the poppy seeds in a small saucepan over a low heat for a few minutes. Remove from the heat and allow to cool slightly. Sift the flour into a large bowl, then whisk in the sugar, lemon zest and poppy seeds. In a separate bowl, beat the eggs with the yogurt and melted butter. Whisk the wet and dry ingredients together until smooth and lump-free, then divide between the cases. Bake for about 20 minutes, or until a skewer poked in comes out clean – the cakes will be quite pale on the top. Cool for 5 mins in the tin, then carefully transfer to a wire rack to finish cooling. In a stand mixer fitted with the paddle attachment, beat the butter and icing sugar on slow speed until it resembles a fine powder. Add the cream cheese, increase the speed and beat until a creamy mixture forms. Add the blueberry purée a little at a time, until you have the colour and consistency you like, then continue to whip on high speed for a couple of minutes more until light and fluffy. 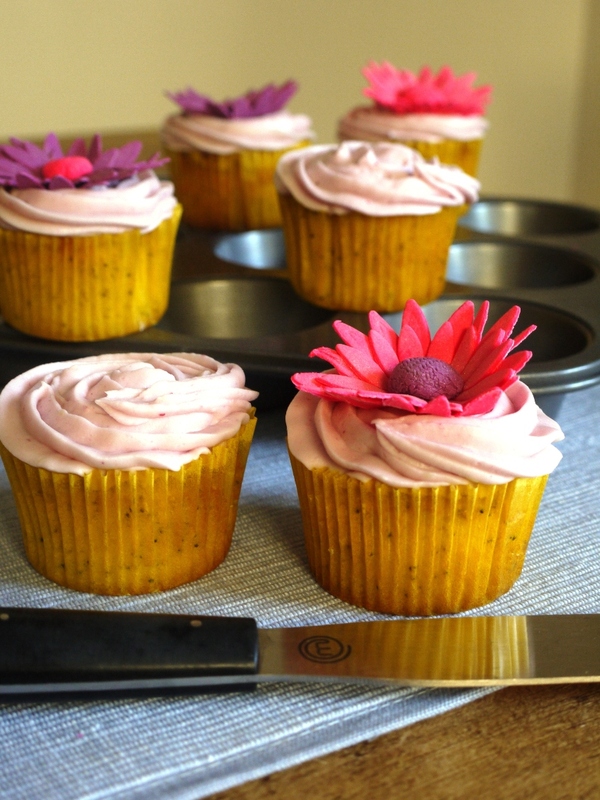 Transfer your buttercream to a piping bag and pipe over the cooled cupcakes. 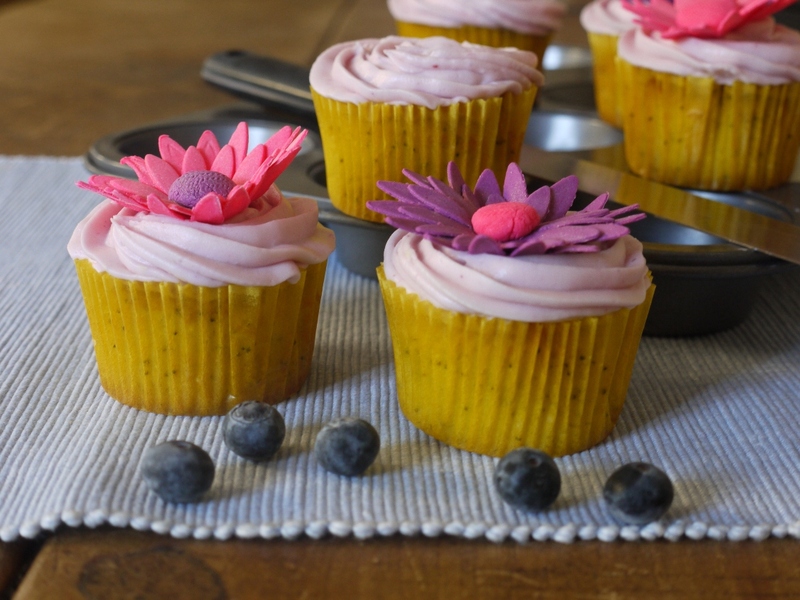 Decorate with fresh blueberries, or sugar paste flowers, if you wish (I used this tutorial here). These cupcakes taste best served at room temperature, so are best made and eaten on the same day to ensure the cream cheese frosting stays fresh and delicious. Lemon and poppy seeds are a match made in heaven and your flowers are so beautiful! You have to show us a picture of the wedding cake in August! These are beautiful. I love citrus and poppyseeds together. I make a syrup cake : http://heikeherrling.com/2012/02/06/a-seedy-citrus-cake/. I love the flowers – so pretty! These look so lovely! I love lemon & poppy seed together as well as lemon and blueberry. What a winning combo! Aww these look lovely. I too am up in Yorkshire for the Easter weekend! Amy – thank you, and I definitely will, as long as the cake looks beautiful! Savory Simple – lemon and blueberry works together so well, will definitely be making again! Meister – this is definitely the perfect treat to welcome in Spring! Daisy – thank you, and yes – they’re definitely daisies! These are absolutely gorgeous!… :] I love the combination of lemon and blueberry. Ah, so beautiful. I love the look of that blueberry buttercream… how have I never heard of that before? So inspiring! What lovely pretty and Spring like cupcakes! Really looking forward to reading how you get on with the wedding decorations- on evidence of these beautiful flowers, you’ll have no problem at all!! Loaf, those are so pretty – I adore them :D. I wish I could decorate with the same skill and dexterity as you. A Taste of Madness – thank you! 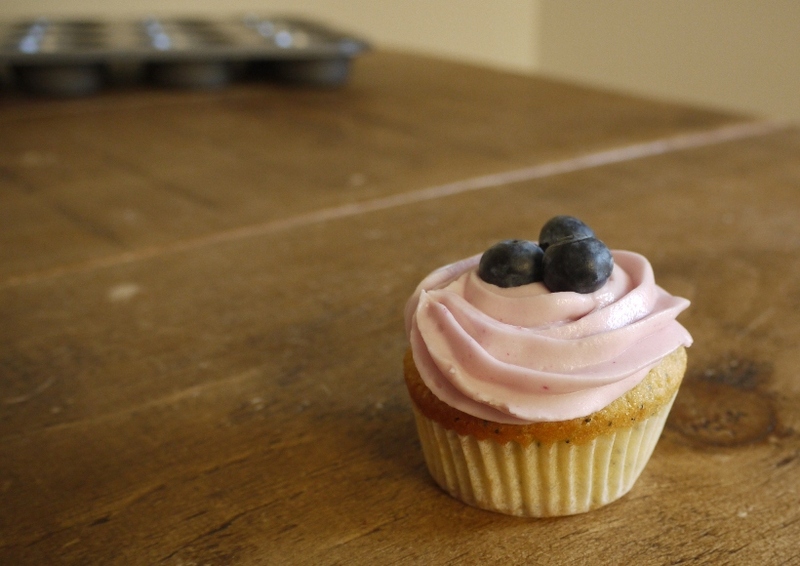 Emma – the blueberry buttercream is yummy although the flavour is fairly subtle. Next time I might add a little more puree, although I do love the pale pastel colour this quantity gives. Kafcia – Happy Easter to you too! Amy – thank you lovely! These look amazing! Lemon and blueberry is one of my favourite flavour combinations. I love the addition of poppy seeds – must try that next time. Good luck with making the cake decorations for the wedding cake – I’m sure it will be stunning, can’t wait to see it. Happy Easter! I hope you had a lovely Easter weekend with your family. Your sugar flowers are gorgeous and you’d never know it was a first attempt. The cupcakes sound perfect for a Spring afternoon tea. I am going to have to try the blueberry buttercream, that sounds amazing. Oh, I love the sugar paste flowers. SO cute! And what could be bad about Blueberry Buttercream. Yum. lemon-poppy-seed is one of my favorite combinations (just posted some crispy cookies, on that note…). anyways, your cupcakes look delightful! and i wish i had one now! Blueberry and lemon is one of my favorite flavor combinations. Although I have never tried it myself, a blueberry-cream cheese frosting makes so much sense! And this does not at all look like your first attempt at sugar paste flowers. I love lemon and poppyseed muffins so the idea of them in cupcake form with a blueberry buttercream sounds just heavenly! Laura – thank you so much. Do try the blueberry buttercream, it’s delicious. Erin – absolutely nothing, it’s divine! Sacha – hopefully I’ll get much better over the next couple of months! Kathryn – they’re really good – perfect for this time of year. Of course I wish you luck, but I have every faith you will do an absolutely splendid job. I love those flowers. I was going to ask you where you got them from, then read you’d made them yourself! 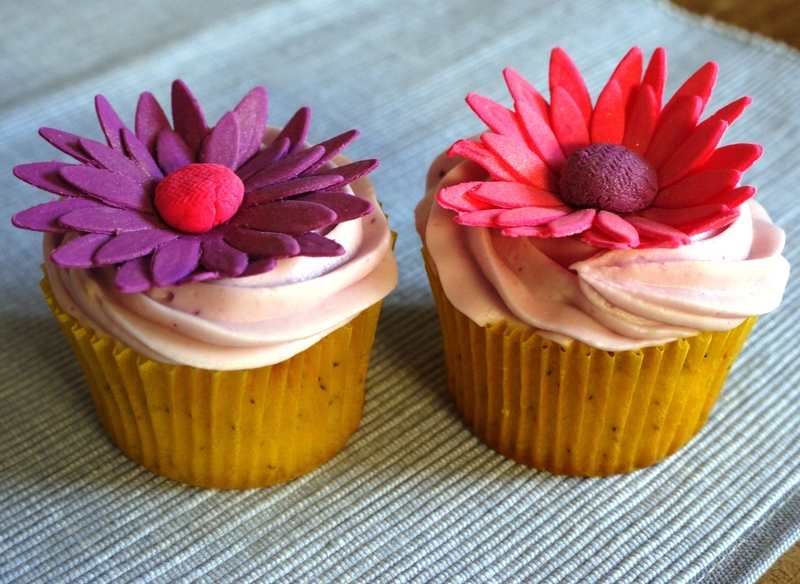 Love the idea of using blueberry puree and the tone it gives to the buttercream is quite elegant. Thank you so much for all of your lovely comments on my blog. I do feel bad for not visiting yours more often and it’s not because I don’t appreciate it, I love your blog. I’ve just been incredibly busy over the last few months and am struggling to even lag behind, never mind keep up. I join the chorus of lemon blueberry love! Your flowers are so cute! They make the perfect topping for those cupcakes. Fantastic recipe, love that you kept the icing on the less sweet side. i’l have to keep it in mind. Choclette – ah, thank you, you’re too kind! And no worries re blog comments, I know how busy you are! 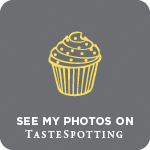 Muppy – there’s nothing worse than too much sickly sweet icing. These are my kind of cupcakes! Not too heavy on the buttercream and with what sounds like a tasty cake and topping. My favourite picture is the minimalist one with the single blueberry topped cake. Nicely composed! Euan – I like that photo too 🙂 The other ones are fancier but sometimes it’s simplicity that really appeals. Sarah – lemon + poppyseed = amazing. Will keep you posted on the wedding cake flowers – cross your fingers for me! I’ve never thought of toasting poppy seeds before – such a clever idea. The blueberry cream cheese icing sounds gorgeous! Love the flowers – so colourful. Not used poppy seed sbut I bet they go great with lemon so now another thing to try out! Love it. Good luck with the wedding flowers. Your cupcakes are beautiful and I love the flavor combination. Must try these! I am sure you will be doing an incredible job for the wedding.